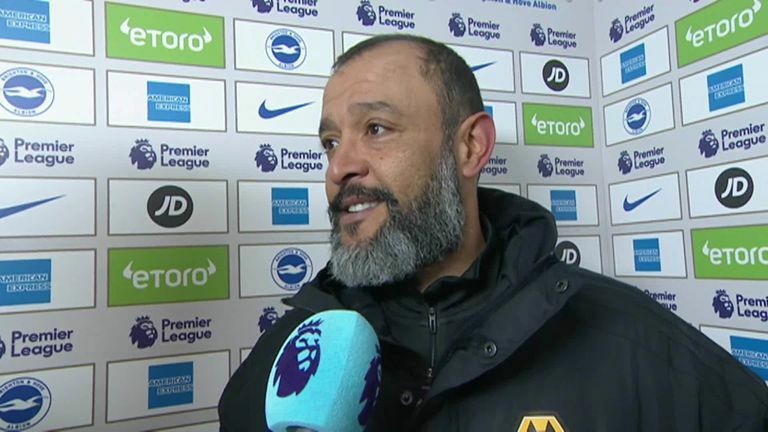 Nuno Espirito Santo claimed his Wolves side deserved more from the game as they lost 1-0 to Brighton. Wolves head coach Nuno Espirito Santo wants his players to be more clinical in front of goal after they dominated Brighton, but still lost 1-0 at the Amex. The visitors were on top for large periods of the game on the south coast, having 25 attempts on goal, only to lose out to Glenn Murray's 48th-minute strike. However, despite a second straight defeat, Nuno was pleased that his side had produced an improved display from last weekend's 2-0 home defeat to Watford. "The result was definitely not what we expected," he said. "The boys worked for it and the performance was good. It was better [than last week] and a good reaction. "But we must improve on the final touch, we created many chances, we deserved to put [the ball] inside the net and today was not the day. "[I am] a lot [disappointed with the goal] - from a throw-in. Small details change realities and the reality of this game was changed by the detail of the throw-in that we conceded a goal. "The reality is we did enough to deserve [not to lose]…. but credit to Brighton, they defended and threw bodies on the line of the ball." Wolves were also denied a first-half penalty when Matt Doherty's powerful drive appeared to strike the arm of Brighton winger Jose Izquierdo. And Nuno, who changed his starting line-up for the first time in the Premier League this season, was unhappy that referee Anthony Taylor did not point to the spot. "I know it's hard, the job of the referee, but I think everybody saw it was a clear handball - but he didn't see it, he didn't give it," he said. "Sometimes the referee sees things and gives them, sometimes they don't see it."